On March 17th 2016, in the framework of institutional university cooperation program between Hue University and Flemish universities and university colleges, Belgium (VLIR-IUC), Hue University held a conference on university governance models in a changing academic world. Conference keynote speakers were Assoc. Prof. Dr. Nguyen Van Toan, President of Hue University; Prof. Gerrit Janssens, Hasselt University, Belgium; Prof. Dr. Le Quang Minh, former Deputy President of Vietnam National University HCM City, former Rector of Can Tho University; Director of the Institute of University Management - Vietnam National University HCM City; Prof. Nguyen Minh Thuyet, Member of Vietnam National Assembly for 2 terms XI, XII, former Deputy Chairman of the Parliament's Committee for Culture, Education, Youth, Teens and Children; Dr. Dang Van Dinh, the Association of Vietnamese Universities and Colleges; Prof. Lam Quang Thiep, former director of the Department of Higher Education (Ministry of Education and Training); Prof. Le Van Khoi, Arizona State University, USA. 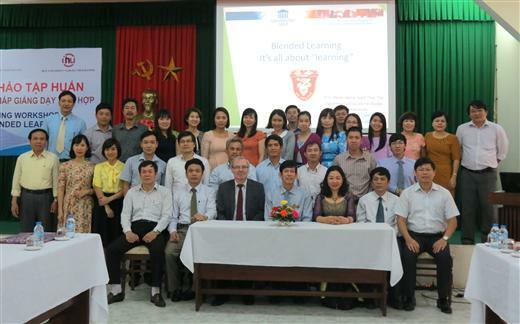 Hue University hosted the Joint Steering Committee Meeting in the framework of VLIR-IUCprogramme from August 27-28, 2015.